Looking for a Computer Networking company who has the experience in building your very own server room? Whether its for your home or business, our computer networking specialists provide support to business clients of all sizes. We handle both workgroup and domain controller networks, depending on the amount of workstations. We can also network your house or office from the ground up, including installation of RJ45 wall ports if needed. Our network wiring experts have the tools to get you online in no time. With over 5 plus years of experience in the computer networking field. Our company services the greater Los Angeles, CA and surrounding areas. Computer networking can be defined as a bunch of computers that are linked up together. Preferably through a hard wire connection. A properly configured network acts as a system that provides unique capabilities to its users. 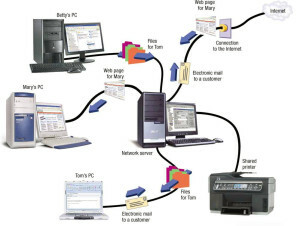 The benefits of computer networking offers its users the ability for sharing resources and information between other workstations. Most businesses run off in house servers, connecting unlimited number of workstations together. Computers that connect to a workgroup network are connected through a local area network. Sharing of data is commonly used through in house networks, which helps save a lot of time and energy. This also makes it easy for applications such as databases to be accessed, by individuals as shared data. It is the interconnection of multiple devices, generally termed as hosts connected using multiple paths for the purpose of sending/receiving data or media. There are also multiple devices, which helps in the communication between two different devices. These are known as computer networking hardware devices. For example Routers, Switches, Hubs, etc. Backbone network is a computer network infrastructure that provides a path for the exchange of information between different LANs. A backbone can tie together diverse networks within the same building, across different buildings, or over a wide area network. For example, a company might implement a backbone network to connect departments that are located around the world. The equipment that ties together the departmental networks constitutes the network backbone. When designing a network backbone, it is very important to look into computer networking performance and bandwidth speeds. Here is where VPN’s come into play, allowing peer to peer connection with proper encryption. A virtual private network is an overlay network in which some of the links between nodes are carried by open connections or virtual circuits in some larger networks. The data link layer protocols of the virtual network are said to be tunneled through the larger network when this is the case. One common application is secure communications through the public Internet. VPN’s separate the traffic of different users over a network with strong security features, when it comes down to computer networking. In order to setup a secure VPN, we would need a proper router to be setup at all locations. This will allow one or more office locations to handle the VPN connection. There are two types of LAN computer networking options in a small to corporate level business. See below to understand the differences between the two types of networks. In a workgroup based network, every computer has its own username and password to log on to the local machine. The user can access their workstation, with the option to use a weak password or even no password at all. This can be a serious security concern as user workstations usually have sensitive information on them. Virus protection can get out of hand in workgroup based networks of more than a few computers. This is mainly because people don’t have time to spend making sure their computers are secure. If a certain workstation catches a virus, it is possible that the virus can spread throughout the entire network. A workgroup network will allow other workstations to be able to share files with one another without any issues. Our networking specialists can assist you to see which network would work best for your company. Computer Networking is one of our few specialties. Contact us today and let us be your number one solution in building your enterprise. Employees in the organization work on the domain network workstations. In addition the Domain Controller known as the server, is capable of managing the user workstations in many different ways. By logging the computers onto the domain, it authenticates across the network to the appropriate user account. Connecting to the Domain Controller. It then verifies the password stored there, rather than doing the same on the local computer. In this way, only users with specific rights and policies are able to log in with their username and password as programmed in the domain controller. Reporting viruses to the Domain Controller and ultimately the administrator. This frees up time for the end user to work. However, its not required for all organizations to switch over to a domain network. The minimum you need to operate with a domain is one computer running Windows Professional or higher. In addition, a Domain Controller server would also be necessary. Most small businesses with only a few computers may not be able to justify switching over to a larger domain based network. Our networking specialists can assist you to see which network would work best for your company. Computer Networking is one of our specialties, contact us today and let us build your proper enterprise. In fact, network administrators typically have different views of their networks. Users can share printers and some servers from a workgroup, which usually means they are in the same location or LAN. Whereas a network administrator is responsible to keep that network up and running. Both these networks listed above should have in house servers locally with proper cloud storage in order to keep all information safe and backed up. For more information on computer networking, you can always contact us and we will be glad to answer any further questions. In conclusion, the video listed below talks more about computer networking and about our company. Sean and his team were very professional, helpful with explaining everything and patient. They really went the extra mile and were willing to work with our schedule and needs. Thanks Sean!